Machu Picchu Suites is a comfortable and affordable Apartment-Hotel hidden in the heart of the district of San Miguel in Lima Perú, just steps from La Marina Avenue and Elmer Faucett Avenue. The combination of a furnished apartment and warm atmosphere combined with hotel services is what makes the Machu Picchu Suites an excellent choice for a stay in Lima. The homey atmosphere and the kitchenette each room is equipped with, makes Machu Picchu Suites a perfect solution for business traveler who requires an over night stay and for tourists and couples with their children. With 20 apartments & Suites, the property offers an interesting alternative to the conventional hotel for months, weeks or days. In your next trip of pleasure or business to Lima - Perú; don't hesitate to lodge in Machu Picchu Suites; beautifuls furnished apartments, fully equipped at preference low rates (Utilities included). Come only with your luggage and here you'll find everything you need. Transfers airport/lodge - lodge/airport (optionals). .
Also we can assist you in Spanish , English, French, or Italian. Living & dining room (modulate sofas, Chairs, table, pictures, and etc). Fully equipped kitchen ( Refrigerator, microwave, mixer machine, dishes, dinner set, and etc.). Electronics:television (with cable), VCR or DVD, Stereo/CD player, Telephone, intercom . (Also iron & ironing board). Bathroom (cold and hot water). Utensils of cleaning, if yourself want to make the cleaning of your apartment. Laundry service, cleaning and garage are optionals, they have additional cost. Double room: This is an apartment, where can sleep 2 people. It have a kitchen room with refrigerator , micro wave oven , utensils, etc. Twin room: It have twin beds for 2 people. Kichen with refrigerator , micro wave oven , utensils, etc. Superior Apartment: It have living - dinig room, one or two bedrooms, kitchen and others facilities. Machu Picchu Suites is located in a quiet and residential neighborhood, close to the Jorge Chávez International Airport, at one block to La Marina Ave, a main street in the capital, where most of the commercial business activity is found. Guests will supermarkets, stores, financial centers, theaters, nighttime entertainment, and restaurants in the area, just to mention a few blocks is San Miguel Shopping Center. Plaza San Miguel (Shoping Center):0. 6 km. Metro (Supermarket): 0. 4 km. Parque de la leyendas (zoo): 0. 5 km. Larco Herrera Museum: 1 km. Pontificia Universidad Católica del Perú: 0. 7km. Universidad Nacional Mayor de San Marcos: 0. 9 km. There are no room charges for children under the age of 5 occupying the same bed as their parents. Wheelchair accessible rooms must be requested at time of booking and are subject to availability. 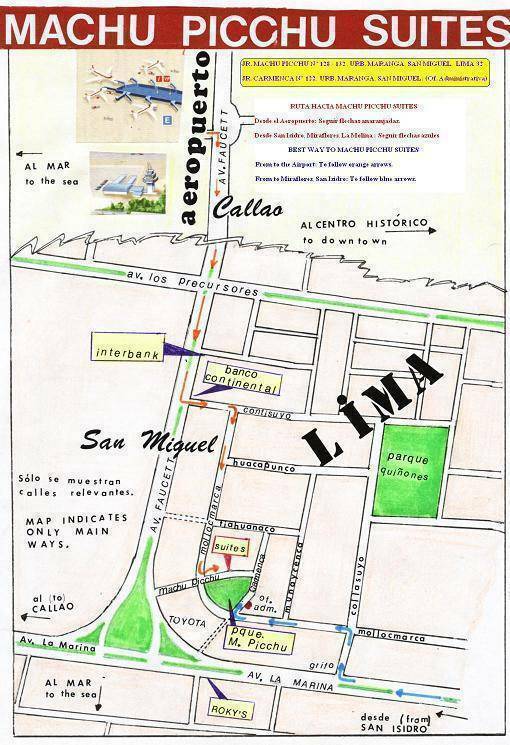 From "Jorge Chávez" International Airport, turn right to Elmer Faucett Avenue and go straight ahead toward La Marina Avenue in the district of San Miguel. Two blocks before arriving to the Marina Avenue turn left by Contisuyo Street ( BancoContinental)one block, then turn right by Mollocmarca street and go straight ahead until Machu Picchu Park. Our Lodging is located in MACHU PICCHU Street 128, in front of the Machu Picchu Park (behind Toyota Pana-Autos), but first you'll pay the reservation and pick up the keys of the apartments, in our Administrative Office, located in the adjacent street, CARMENCA 122 (also in front of the park). Del Aeropuerto Internacional Jorge Chávez tome la Av. Elmer Faucett hacia el distrito de San Miguel. Dos cuadras antes de llegar a la Av. La Marina doble hacia la izquierda (esquina del banco Continental) por Calle Contisuyo, avance una cuadra pequeña y doble a la derecha por Jr. Mollocmarca, luego avance hasta el parque Machu Picchu. Al llegar al parque doble a la derecha por Jr. Machu Picchu (en algunos planos figura simplemente como Jr. Picchu). Nuestro hospedaje está situado en Jr. Machu Picchu 128. La calle adyacente es Carmenca donde quedan nuestras oficinas administrativas en Carmenca 122, donde se efectúa la entrega de llaves. Nota: El hospedaje no tiene letrero publicitario para la total privacidad de nuestros huéspedes. Nearest airport: Jorge Chavez International Airport is approx. 1.5 km.